On Monday, we received a good portion of Swiss chard in our farm share, which I don’t have very much experience with. So I was happy to find this recipe on Epicurious, adding a bit of pasta to turn it into a main meal based on Epicurious user recommendations. 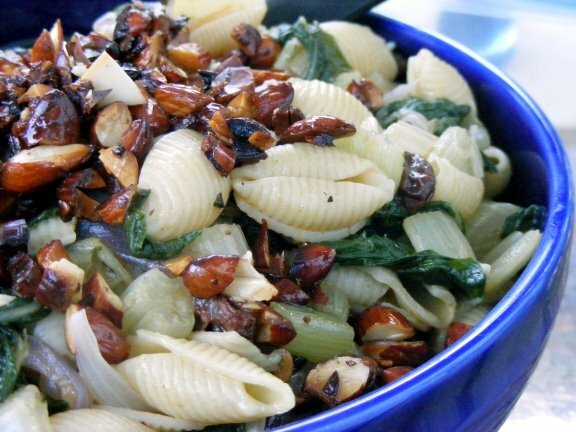 I very much like how healthy this is: Swiss chard, almonds, raisins, and EVOO are very, very nutritive things to eat (better yet, use whole wheat pasta). Unfortunately, the final result here was a bit bland; everything just needed more “oomph” — but this may be due to my tinkering with the recipe. Next time, I’ll increase the amount of smoked paprika (which was wonderful) and thrown in a bit of cinnamon and maybe cardamom to boot. After washing & drying the Swiss chard, remove the center ribs and slice into 1/4-inch pieces. Chop the leaves coarsely and set aside. Cook onion and chopped chard ribs with 1/4 teaspoon salt in 3 tablespoons oil in a 5- or 6-quart heavy pot over medium heat, stirring until softened. Sprinkle with paprika and cook while stirring, 1 minute. Add the chopped chard leaves in batches, stirring frequently until wilted, then adding raisins and water. Cover and cook, stirring occasionally until chard is tender, about 7 minutes. When finished, toss with pasta and adjust seasonings. While chard leaves are cooking, start preparing the almonds. In a small heavy skillet over medium low heat, cook the nuts in the remaining 1/2 tablespoon oil, stirring frequently until golden, 3 to 5 minutes. Sprinkle almonds over pasta and chard.